EghtesadOnline: As if the bull run is not about to relent any time soon, Tehran stocks continued their rally on Saturday as a surge of liquidity gravitates toward the equity market. While the stock market growth has been lauded by analysts and officials in equal measure, a growing number of experts seem skeptical about the substance of the rally and fear that speculative bets are gradually supplanting earlier growth backed by fundamental factors. On the first trading day of the week on Saturday, the Tehran Stock Exchange's benchmark index, TEDPIX, closed up 6,770.46 or 3.75% and crossed the 187,406 point for the first time. TSE had a 15% return on investment during the week that ended September 26. The stock market's ROI during the summer of 2018 was 47.5%, bringing the market's total gains since the beginning of the financial year on March 21 to more than 66%. But parallel markets were even more bullish during the period: the US dollar gained 93.7% against the rial and the benchmark Bahar Azadi gold coin brought a hefty return of 74.6% to investors in the summer. The monetary market came last, with long-term bank deposits yielding a real interest of 3.75% (considering the official deposit rate of 15 %.) Since the start of the financial year until the end of summer, the currency market has had a return of 197%, making it the top choice of investors hunting for safe-haven assets, Financial Tribune reported. While the entry of small investors was initially welcomed as a boost for the less-developed capital market and a step away from the saturated currency and gold markets, now there is growing concern that small investors are treating the stock market as a vehicle for quick, speculative gains. Analysis by the website Donyae Bourse on Saturday confirmed that the speculative trend is gaining momentum. While it was anticipated that as more monthly earnings reports are released by companies, it said, the buying frenzy would be streamlined in proportion to corporate profits. This has not happened. Investors, seemingly spurred by the herd mentality, are scrambling to buy shares in a discriminate manner. The rial's s slide against major currencies is believed to be behind the perception that all export-oriented companies are making profit. In other words, the fear of rising inflation is prompting investors to buy stocks before prices soar. The rial has weakened to record lows against foreign currencies in recent months. The official exchange rate, set by the central bank in April, is still 42,000 to the greenback. The trend where almost all stocks are doing well indicates that "fundamental factors" are no longer fueling stock growth. Donyaye Bourse says that out of 440 active ticker symbols, 400 or 90% of them close trade at higher prices. In short, if others are buying, you must do likewise even if stocks are overvalued. For instance, although monthly earnings reports of carmakers and car parts makers fail to impress and indicate disappointing results around the corner, investors seem to care little. According to the Central Bank of Iran, goods and services Consumer Price Index for urban areas for the calendar month ending Sept. 22, increased by 31.4% compared to the same month last year. The overall CPI stood at 141.9 in the period, indicating a 6.1% increase compared with the previous month. The average CPI in the 12 months ending Sept. 22 increased by 13.5% compared with last year’s corresponding period. The Persian-language economic newspaper Donya-e-Eqtesad on Saturday predicated that in the best case scenario, annual inflation by the end of the year (March 2019) would be around 26% and in the worst as high as 34%. Based on recent experience, experts predict that if share prices continue the upswing and liquidity keeps arriving, the inexperience of new investors could mean “poison" for the market, turning into a dangerous cycle if price corrections ensue. 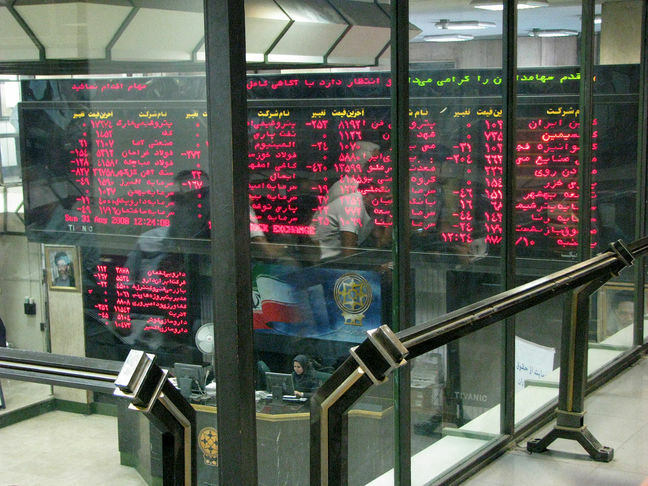 Tehran Stock Exchange’s main index gained 6,770.46 points or 3.75% on Saturday to end trading at 187,406.1. About 3.7 billion shares valued at $87.88 million changed hands at TSE for the day. Persian Gulf Transportation Co. was the biggest winner as its shares went up 17.36% to 10,959 rials per share. Pakshoo Industrial Group incurred the biggest loss among all TSE-listed companies and went down 4.49% to 19,156 rials per share. Persian Gulf Petrochemical Industries Company gave the biggest boost to the benchmark index, followed by Tamin Petroleum and Petrochemical Investment Company, and Isfahan Oil Refining Co. Mobile Telecommunication Company of Iran was the biggest laggard behind the benchmark's fall, followed by Iran National Copper Industry Company, and Pakshoo Industrial Group. The Price Index gained 1,978.84 points to close at 54,772.7. The First Market Index was up 4,596.67 points to post 137,866.7. The Second Market Index added 15,367.20 points to reach 374,187.2. The Industry Index increased by 6,233.84 points to register 170,969.8. The Free Float Index was up 7,177.13 points to hit 199,650.25. The TSE 30 went up 325.07 point to settle at 8,957.8 and the TSE 50 ended 302.03 points higher to finish at 8,049.4. Iran Fara Bourse’s main index IFX gained 79.88 points or 3.86% to close Saturday trade at 2,150.9. About 1.34 billion securities valued at $44.53 million were traded at the over-the-counter exchange for the day. Esfahan Steel Company had the highest number of traded shares and trade value as 224.4 million of its shares worth $4.67 were traded. Iran & Shargh Leasing Company, Ghadir Petrochemical Co., and Atieh Dadeh Pardaz Company registered the highest value increase. Mobinone Kish Company, Chaharmahal Food Products and Sugar Company, and Tadbirgaran-e Fars and Khuzestan Co. suffered the biggest decline. Marun Petrochemical Company, Esfahan Steel Co., and Zagros Petrochemical Company had the most positive impact on IFX.